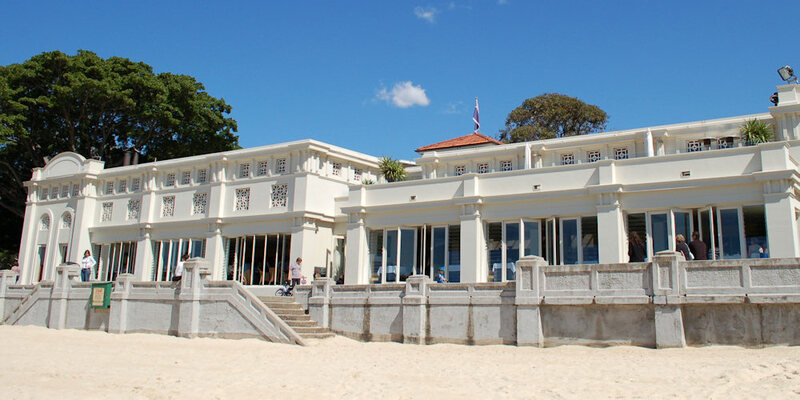 Bathers Pavilion sits grandly on Balmoral beach, one of Sydney’s premier waterfronts. Luscious fig trees line the esplanade and waves casually lap the shore. Along with mansions on the hill, Balmoral boasts parking fees of $6 an hour and large crowds on the weekend. However if you’re planning an indulgent weekend, we recommend packing your wallet and starting the day luxuriously at Bathers. The building is a delight to look at from the outside. 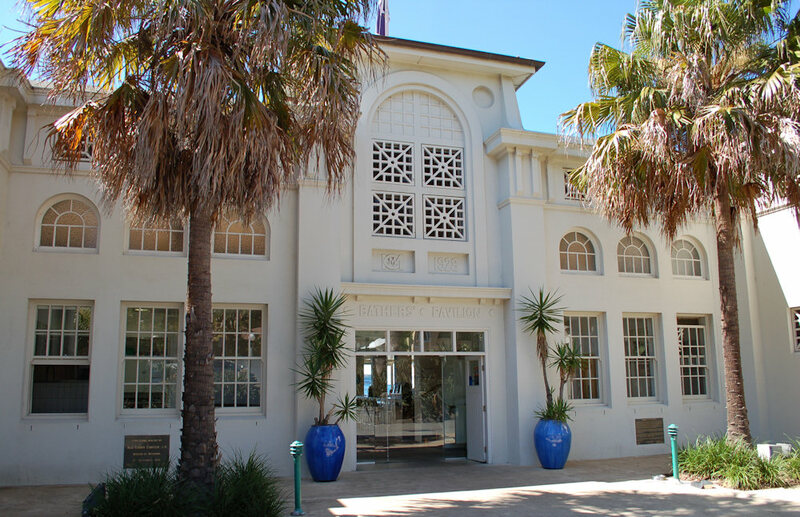 It opened in the late 1920s as a changing room for conservative swimmers. Today it serves as an upmarket café, restaurant and kiosk. The venue is perpetually busy and they don’t take bookings for breakfast. The café breakfast menu contains items such as Ginger poached quince with cinnamon yoghurt ($15.50) and soft boiled free range eggs with smoked salmon brioche fingers ($20.50) which sets the tone of a decadent meal to come. The wait staff seemed aloof when we arrived and continued to do so for most of the meal. Our drink orders were eventually taken and arrived one by one over a prolonged period. The menu lists a large variety of freshly squeezed juices including: orange, apple, grapefruit, cranberry, watermelon, pineapple, carrot and celery. You can opt for any combination of these. 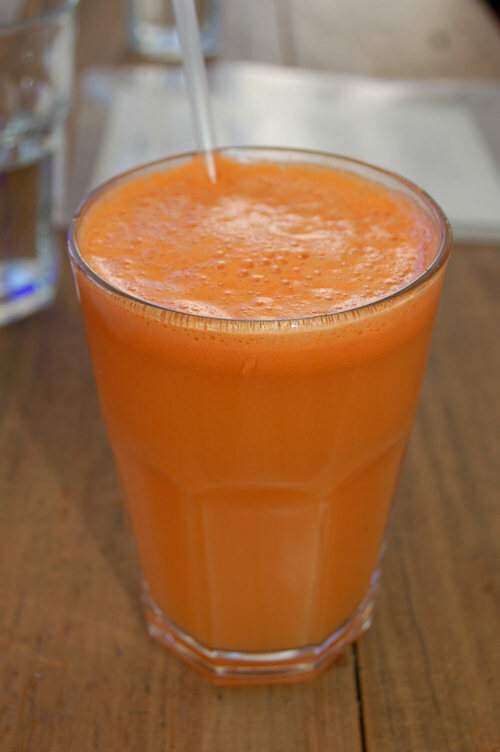 Dane chose one of his favourite mixes: carrot and pineapple ($6.30). 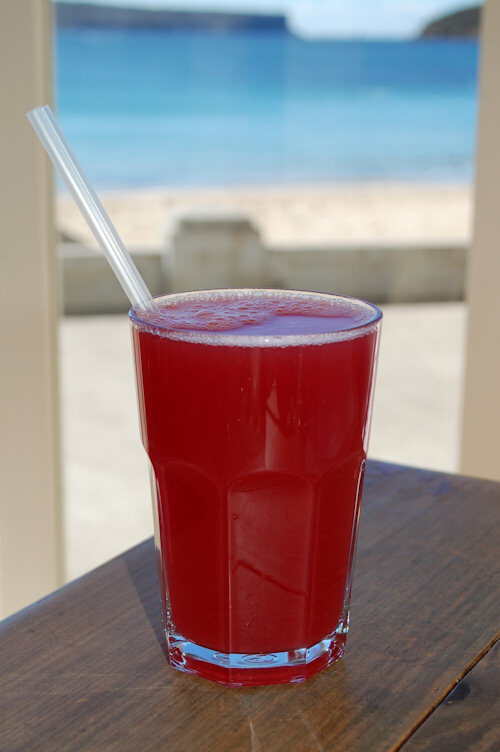 The juice was prepared just how we like it: well blended with cold fruit and in a decent sized glass. A range of alcoholic and non-alchoholic cocktails are also on offer and all have the air of well thought-out concoctions. April enjoyed the cranberry cocktail ($7) which contained a surprise ingredient of fresh watermelon. It was light and thirst quenching, perfect on a warm spring morning. 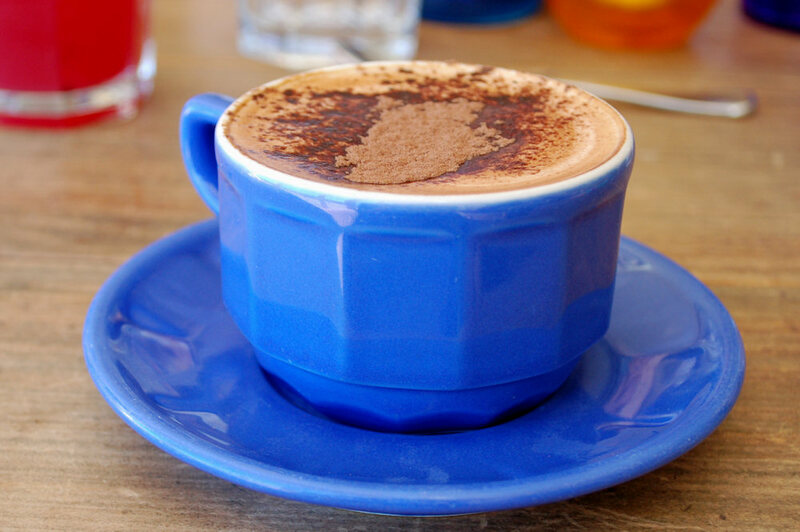 We continued the trend of ordering a skim cappuccino ($3.70) which arrived in a gorgeous blue cup. Be prepared to order 2 regular coffees, or one “mega cup” for $6 as the cups are smaller than we’re accustomed to. The coffee was smooth and delicious however not as impressive as we expected. Not only is Bathers’ capable of serving delicious complex dishes but the chefs also excel at preparing the simple ones too. 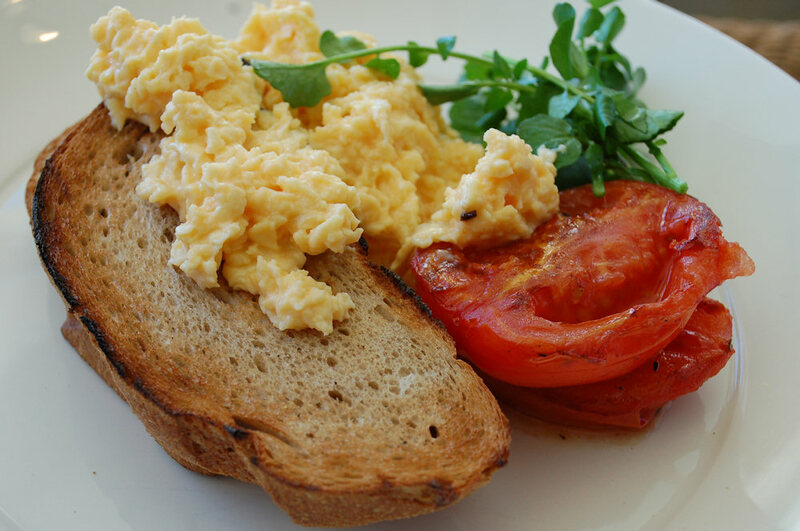 One of our guests ordered your choice of two eggs on rye toast with roast sea salt thyme tomatoes ($17.50). She requested the eggs well done and she couldn’t stop raving about how great they were. The meal was presented with a touch of class that makes this establishment so popular. 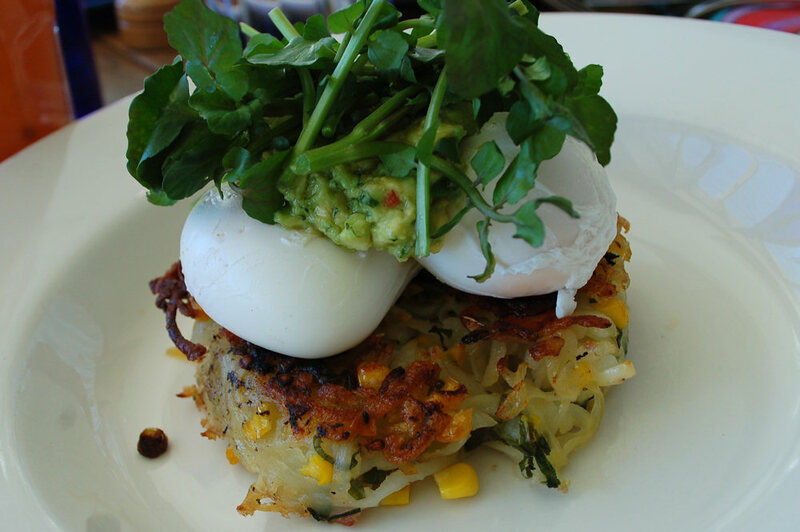 The corn and bacon hash with poached egg and avocado ($21.50) was a smaller serving than we would have hoped for. The hash is made up of strips of potato which seemed slightly undercooked and gave great texture to the dish as opposed to being too squishy. The flavour of the bacon was not very discernable but all of the ingredients together made up for any complaints one could have. 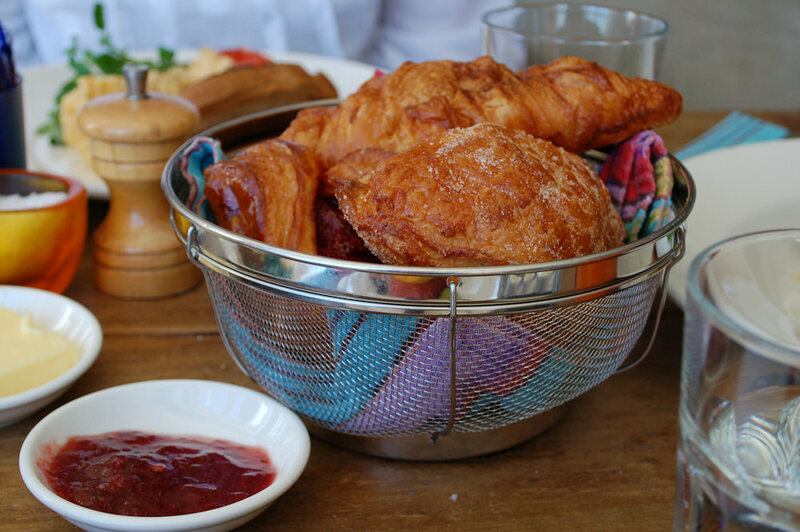 For big eaters, be sure to order the larger Balmoral breakfast ($24.50) or some extras for the table such as the basket of pastries (see below). 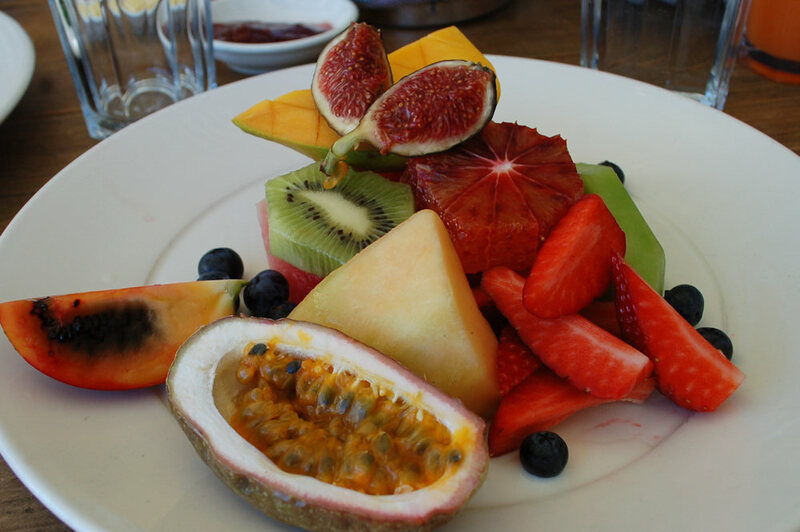 The fresh fruit plate ($16.50) came beautifully presented but the waiter dropped it onto the table and made us jump. We were taken aback with his carelessness and it ruined what the chef had clearly taken some time to create. The figs, mango and blueberries were amazing. There was a great variety of succulent fruit (not just rock melon and apple which we usually get). On the downside the blood orange and tamarillo were clearly under ripe and had a sharp sour taste. 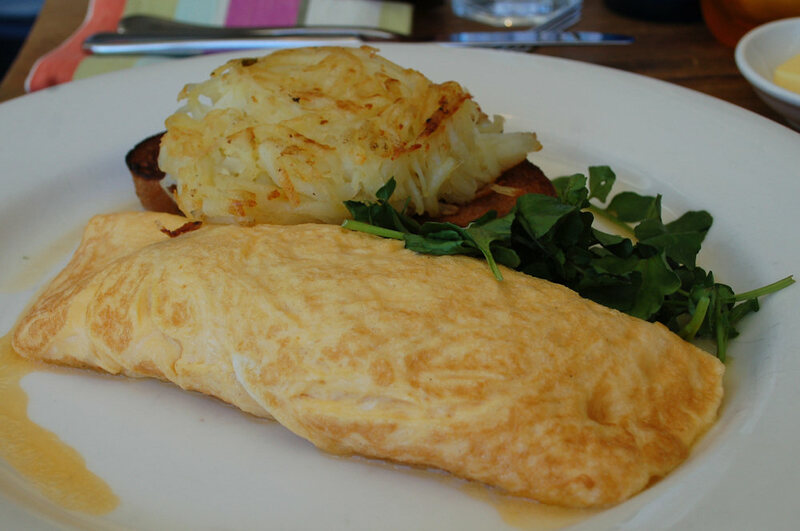 The free range omelette with gruyère cheese and ham ($21.50) was a delicate and rich meal. The eggs were beautifully cooked and combined a subtleness to the robust flavour of the cheese. There was also plenty of ham folded inside which added texture to the softness to the dish. The potato on the side seemed undercooked and had a starchy taste. We would’ve preferred it to have been cooked longer. In case you still have room after coffee, juice and eggs we recommend the basket of four pastries ($14.50). If you can’t fit 4 pastries, it also comes with the option of 2 ($7.50). We shared a pain au chocolat, plain croissant, almond croissant and a Danish with strawberries and custard. This is a great dish to share among friends and goes perfectly with coffee. We spent more at Bathers than the average $20 per person. In fact we spent close to $35 per person. We understand this is for the spectacular location, high calibre chefs and quality ingredients. However we were surprised at how casual and careless the wait staff were. We had to ask numerous times for table water & to order extra coffees and the bathrooms were our of toilet paper. All things which are very basic for any café. When we finished our coffees and main meals the dirty dishes remained for so long we had to ask to have them removed. This detracted from an otherwise very pleasant experience. If you make the trip to Bathers for breakfast we recommend staying around in Balmoral afterwards. In the summer the harbour beach is great for swimming. In the winter, bring a picnic blanket and stretch out on the grass. It’s such a gorgeous place that no matter the season, you won’t want to leave. This entry was posted in Sydney - North Shore and tagged Dog friendly, Parking close by, Water views. Bookmark the permalink.